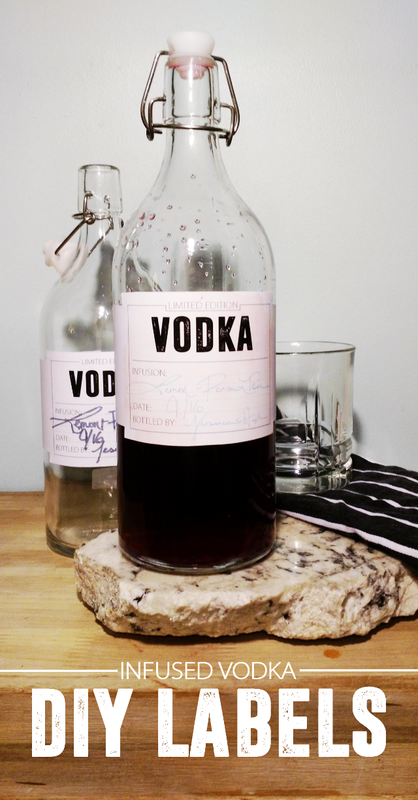 A few weeks ago I was inspired by this post on DESIGNLOVEFEST to make some infused vodka. Except... I didn't really want rose flavored stuff, nor did I know where to get those fancy looking flowers. But recently I've been very into passion fruit tea so I decided to play around with a recipe for a drink based on that. It'd still be pink and pretty, but I could use ingredients I had around the house. 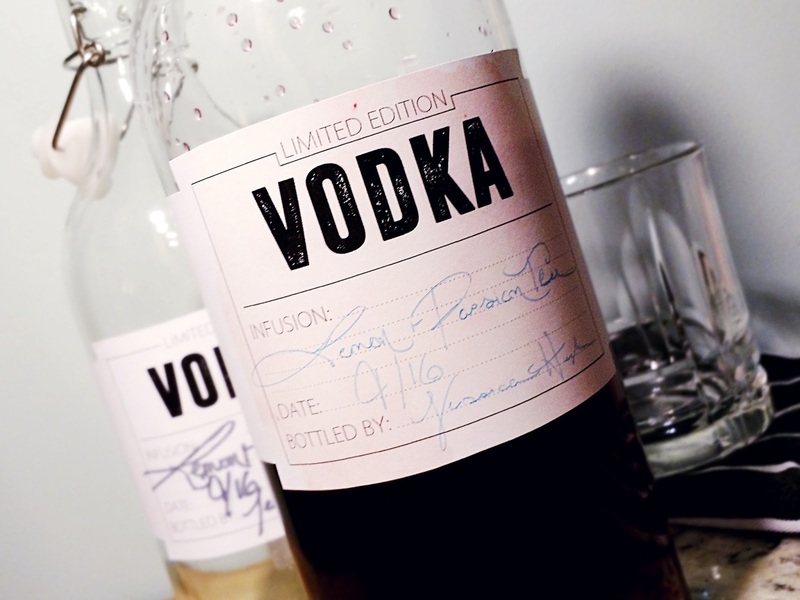 Thus, Lemon and Passion Tea Vodka was born. 1: Start with some decent vodka. All the stuff I read said to use something that's "middle shelf" quality. A little better than Smirnoff, but you don't have to spend an arm and a leg. Split it into two seal-able containers. 2: For the Passion Fruit Tea Vodka: I used 3 Tazo Passion Herbal Tea tea bags. You dip them into the vodka and basically let them "steep" for a few hours (to taste). When they're done just pull out the tea bags. You can use this as a mixer alone, or do the next few steps to give it a little extra kick. 4: Add both of the infused vodkas into one adorable bottle. I used the KORKEN bottle from IKEA. 5: Print out your labels (link at the bottom of the page), fill them out (the sloppier the handwriting the better it looks- think doctor level sloppy), and attach them to your bottles. I left a band that can wrap around, or you can just cut out the label and tape it on. And there you have it! How does it taste? I've tried it with ginger ale, and a little goes a long way. It's more of an earthy flavor, but it defiantly has that kick. And the color makes for a very pretty cocktail! If you want to see a more epic shot of the color, take a look at my Instagram post here. 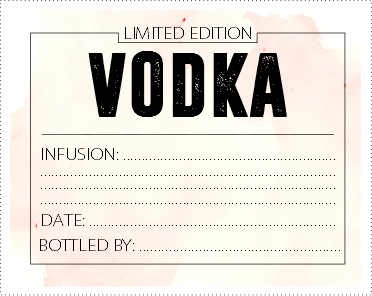 There are a ton of recipes for vodka infusion on the internet, so if lemon and passion fruit isn't your jam go make your own mix up! 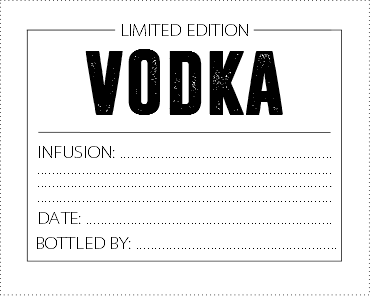 I've left the labels blank, so you can use them for whatever crazy concoction you come up with. Download the pdf for the labels here.